What sound does a tiger make? 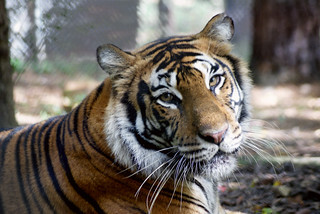 Clearly, the big cats can roar, but there’s a more social greeting the keepers at Carolina Tiger Rescue have grown to know. Get this: they can even mimic it! Tigers chuffle, which is their way of acknowledging you. Carolina Tiger keeper Cara leads this fun video where team members try their best impression of a tiger chuffle!